Tom Miller: A Conservative Case for Obamacare? J. D. Kleinke, my neighbor at the American Enterprise Institute, has written a New York Times op-ed that recycles a fact-challenged rewriting of health-policy history and combines flawed analysis with wishful thinking. Kleinke argues that the individual mandate and health exchanges of the Affordable Care Act (ACA) were, and should remain, sound conservative ideas meriting Republican support. He imagines that, but for crass political calculations, Republican leaders would be taking credit for what President Obama borrowed from them. 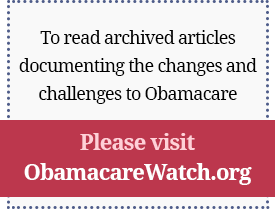 Previous Article: Tom Miller: A conservative case for Obamacare?